SUPBALL (Stand Up Paddle Ball) is a combination of netball, water polo, lacrosse and rugby - played on stand up paddle boards. SUPBALL was created by Manly Kayak Centre and was developed in the summer of 2010/11. SUPBALL takes flat water SUPing to a whole new level. It is a unique game that can be adapted to suit all experience levels. So whether it's your first time on a paddleboard or you are a super SUPper this game will challenge you and make you laugh like never before! We believe that SUPBALL is the most fun you can have on a stand up paddleboard! For many seasons, SUPBALL creators, Manly Kayak Centre had played their own version of Kayak Polo, known as Kayball. This innovative sport was played as an activity within the Kayak Centre’s fitness program. Unlike Kayak Polo, Kayball used round buoys for goals instead of floating nets, and was played with no stoppages unless a injury or a capsize occurred. When a goal was scored (by hitting the opposing team’s buoy with the game ball), the scoring side had to retreat back around their own buoy/goal to enable them to be deemed onside and continue playing. "It was a late afternoon in early December 2010, and after completing our usual packup it was time to have some fun, so four of us jumped on the SUPs and continued to try and better each other on what tricks we could pull off. After putting our skills to the test the Kayball game ball was thrown into the mix, followed quickly by the goal buoys. It was a simple transition from kayaks to SUPs and what emerged was a game that pushed our new found skills to the limits! After a few 2-on-2 rounds we named this new sport SUPBALL!" From that first game in December 2010 the team at Manly Kayak Centre continued to play whenever the opportunity arose. As they played, new skills, techniques and game strategies developed. They soon perfected the ideal team sizes, goal distances and game play. 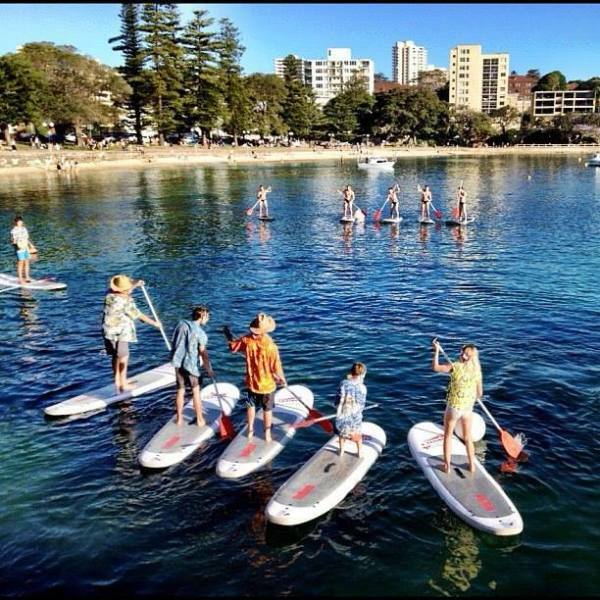 Manly Kayak Centre recognised the growth potential in standup paddleboarding and invested in more SUPs the following Spring. As paddleboarding in general grew in popularity there were less oppotunities for staff to grab boards to have a sneaky game of SUPBALL! The team decided that the time was right to set aside a dedicated SUPBALL timeslot on Sunday afternoons. October 9th, 2011 was the first Sunday game of spring and had attracted a larger than expected line up of excited players: all the usual suspects from the Manly Kayak Centre (MKC) staff and friends plus a new brand of team from Manly Ocean Adventures (MOA). "SUPBALL Sundays continued through until mid-December 2011 and became a highlight of everyone’s week. The standard of play, fitness and physicality moved to the next level as both sides revelled in the competitive environment. What also emerged was the ever increasing number of spectators that were taking a keen interest in the game. 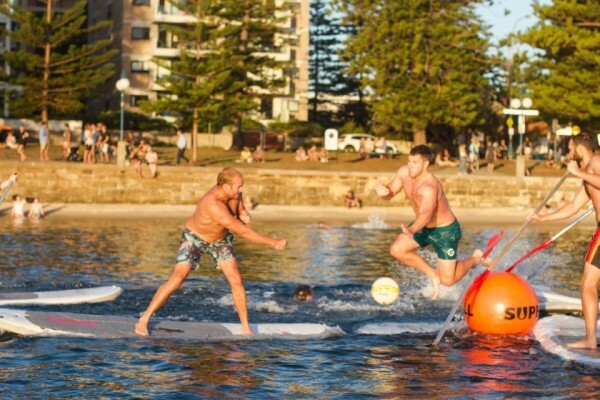 SUPBALL games are played directly in front of Manly Kayak Centre and adjacent to the very popular Manly Wharf Hotel, resulting in a high level of exposure for the sport." From that summer 2011/12 comp between MKC and MOA, SUPBALL grew and grew with new teams joining every year. By 2014 the sport had grown in popularity enough for Team SUPBALL to create a new dedicated weeknight competition on a Wednesday evening. 2015 saw the sport grow again to include another comp on a Saturday morning making a total of three tournaments that year. Now in it's eighth season, SUBPALL is played by 28 teams of 198 players across 4 competitions and continues to grow year on year. 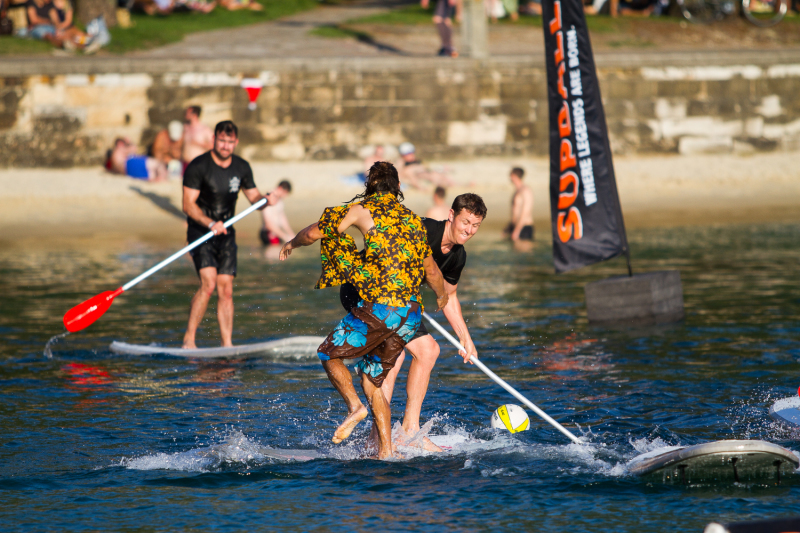 As well as dedicated competitions, SUPBALL has proven to be a popular choice for a range of events. From corporate team building days to kids birthday parties, school groups and even hens and bucks days, SUPBALL’s versatility knows no limits! Tell us how you to be part of the SUPBALL story! 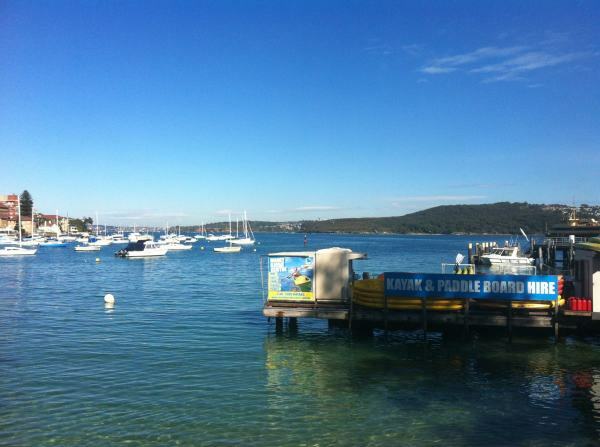 The future looks bright as the community builds in Manly and beyond! SUPBALL has a unique continuous game play and an off side play allowing for very strategic tactics. Boarding other peoples boards is permitted during contact games. You may do this in order to knock another player off their board, steal the ball, block a goal etc.